American Idol is back on our screens. Put downs from Simon Cowell so far include "You should get a job at the port, on a foggy day", and his advice includes "If someone is down in show business, make sure you kick them when they're down". It's a good job that super-nice Randy is also on the judging panel. If you want to watch the repeats, make sure you have a Freeview box. The small, sleek LG KG320 is a candy-bar form factor phone from LG that competes in the slimline market with the likes of the Motorola SLVR and Samsung t509. Measuring just 9.9mm thin, LG have even managed to squeeze a 1.3 Megapixel camera into the KG320 and 128MB of on-board memory! Connectivity is provided via USB or Bluetooth, for sharing data to your computer and other phones or Bluetooth devices. Messaging and internet support is available through SMS, MMS, E-mail and a WAP 2.0/xHTML browser. The lasting impression from this phone is its style and excellent layout. LG have managed to fit a decent camera along with a good sized screen and set of buttons into a tiny and thin bar, avoiding moving parts through sliding or clam-shell designs. All of this in a phone that will turn heads even on the classiest of nights out. We've been getting new brands online, and not just any old brands, we've done our homework and have approached some of the best searched for brands. Timberland Shoes - Yes, the favourites of many boot wearer! We added the mens styles to Shoesdirect a little while before Christmas and they've proved very popular. We're in the process of selecting the womens styles which we'll add very soon. Clarks Shoes - There are quite a few womens boots online, and we're running some very worthwhile discounts. Caterpillar Boots - This is one of the newest brands added to our new "Safety Boots" section, a section dedicated to footwear used in industry (steel toecaps, acid resistant, etc). Brasher Shoes - Another new brand recently added to our "Walking Boots" section which seems to be getting a large amount of attention lately - some say hiking is going to be "the" most popular pastime for 2007. Orthaheel Shoes - Recently added to our "Accessories" section are these footwear inserts that correct improper posture that some people have, and get rid of various aches in legs and feet - not only that they're backed up by a 30-day money back guarantee. Visit shoesdirect.co.uk now or find more shoe retailers at Navito's shoes page. 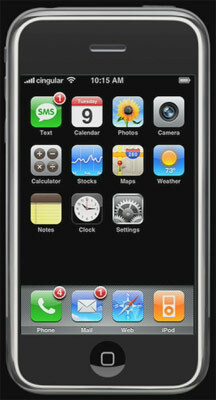 Apple has lauched its long expected mobile phone, the Apple iPhone. Features include a touch sensitive colour display, 2 megapixel digital camera and 4Gb of memory. EDGE and WiFi support gives internet browsing via the Safari browser. Needless to say the iPhone also has music and video players. The phone has great looks, and good usability is to be expected from Apple. It will be interesting to see if Apple can break into the mobile phone market with as much success as it had with the iPod in the mp3 player market, but it faces stiff competition from other mobile phones which can match the iPhone for features. In the mood for some bargains? You'll find details of the 2007 January Sales on our latest shopping offers page.